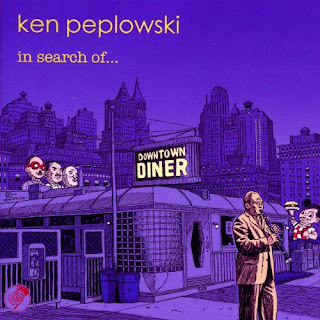 Ken Peplowski is a master of all genres. Born near the end of the swing era, his first musical inspiration was Benny Goodman; as a result, the clarinet was Peplowski’s initial instrument of choice. His career began in a Polish polka band — which he credits with his ability to “play anything at any tempo” — and then transitioned through Dixieland to swing and traditional jazz. Along the way, he also became fluent on the tenor sax. Peplowski is a musician’s musician: His discography is extensive, both as sideman and leader. By the time he had become a first-call artist, most of the famous swing era band-leaders had retired or died, although some of the orchestras had been reincarnated. One of these was the Tommy Dorsey Band, under the direction of Buddy Morrow; Peplowski toured extensively with that group. Goodman came out of retirement for a limited time in 1984, and hired Peplowski on tenor sax; so, finally, master and student were able to play together for a short time. As the years passed, and styles changed, Peplowski adapted. It’s therefore difficult to find artists or groups with whom he hasn’t played and recorded. He concentrated on the standards during his early years, but — as this album illustrates — he has moved with the times. Two sessions were involved. The first involved Peplowski on clarinet and tenor sax, with the backing of pianist Shelly Berg, bassist Tom Kennedy and drummer Jeff Hamilton; the second utilized Greg Cohen on bass, Chuck Redd on vibes and Joe Ascione on percussion. The tunes are a mix of lesser-known charts by other musicians (Freddie Redd’s “The Thespian”), shows (“This Nearly Was Mine,” from South Pacific; “With Every Breath I Take,” from City of Angels) and originals by Berg, Hamilton and Kennedy. It’s a marvelous selection of songs, done beautifully by consummate artists.